Welcome to EMSA South West! EMSA South West works with the community leagues of southwest Edmonton to run youth soccer programs for indoor and outdoor seasons and for our Premier soccer team. For more information on our Premier program, please visit their web site swstingfc.teamsnapsites.com. For a list of all community Soccer Coordinators, click here. SWEMSA U7 to U11 schedules are now posted – Click here to view. 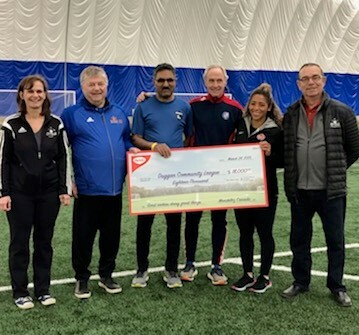 The Duggan Community League has won the Mondelez 2019 Community Soccer Campaign. On March 24, Christie Foods awarded Ali Kamal, on behalf of the Duggan Community, a cheque for $18,000. This generous donation will help go to support a lot of players to stay in soccer and towards the Duggan Mother’s Day Soccer Tournament. Desiree Scott, from the Canada Women National Soccer team, was there to present the award. Thank you Mondelez. Your support for grassroots soccer is outstanding.